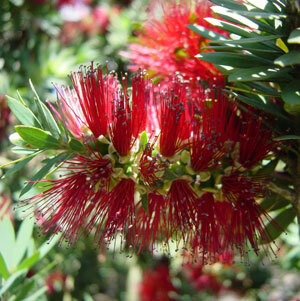 Callistemon citrinus ‘Little John’ is a slow growing evergreen shrub from Australia. The lanced shaped foliage is blue-green with a fuzzy texture on the new growth. From spring to summer the tips of the stiff branches are covered with flower terminals, these flowers have long crimson colored stamens giving them that “bottlebrush” look, hence the common name. The Dwarf Bottlebrush will top out at 3 feet tall with a 5 foot spread, this compact size makes this shrub an ideal plant for small gardens.